In 1980 he had two more hits: You’ll Always Find Me In The Kitchen At Parties and the Christmas single Stop The Cavalry. Now 68, he lives in Streatham, south London, with his partner and 14-year-old son. “I joined my first band, the Johnston City Jazz Band, when I was 14 – I’d play blues and boogie-woogie during school lunch breaks. I stayed on for A levels and then went to Kingston Polytechnic, where I took a degree in sociology. When I was 20, I started writing blues songs, then I joined a group called Brett Marvin and the Thunderbolts – we supported Eric Clapton on tour. “In 1971, I wrote Sea Side Shuffle and we changed our name to Terry Dactyl and the Dinosaurs. Several months later, it went into the charts. I remember it had been really cold, but the day Sea Side Shuffle came out the sun shone! It was lucky timing. It got to number two – Alice Cooper’s School’s Out kept it off the top. “I carried on playing blues piano for musicians such as Arthur ‘Big Boy’ Crudup, then punk rock happened and I signed to a label called Stiff along with Elvis Costello and Ian Dury. I went to a lot of the punk concerts – I remember being at one on the night Elvis Presley died and all the punk rockers cheered when they heard the news, because Elvis was part of the so-called boring older generation. I collapsed with shock then went home and wrote a song called Elvis Presley Was the First Punk. “I was earmarked to be thrown off Stiff until my success in 1980 with You’ll Always Find Me In The Kitchen At Parties secured my position. It sold about 200, 000 copies and reached number 16. The lyric touched a nerve with people. It was great being on Top Of The Pops again after an eight-year gap. Being a pop star frightened me a bit, though. “That same year I had a hit with Stop The Cavalry. I had no idea it would be a Christmas hit. 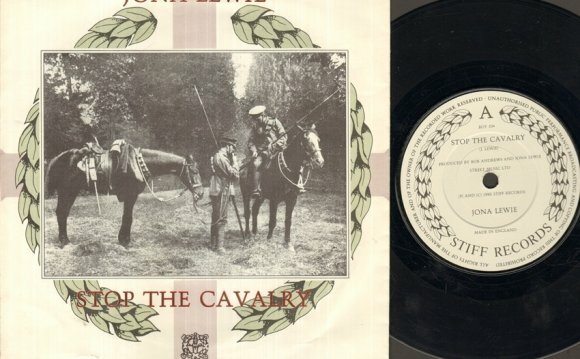 It coincided with the death of John Lennon – he was shot on the day Stop The Cavalry was released. “I spent the 80s and 90s trying to get over my success with that song. It sold about three or four million copies, so I never had to get a proper job! I’ve kept busy, though. In 2005 I appeared in Channel 4’s Bring Back… The Christmas Number One. In 2009 I performed two songs at the London Ukulele Festival. The following year I joined Captain Sensible and The Glitter Band on their British tour. You’ll Always Find Me In The Kitchen At Parties was rereleased after it got used by Ikea – I played the host of a party in the TV ad. I’ve also been working on a new album. It’s about the relationship between men and women, the struggles they go through to meet.